There are all types of people. The worst one are those who never honour their promises, especially not turning up at meeting. 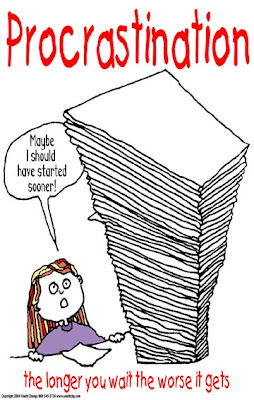 I have a tenant called Andrew whom i proclaimed as 'The King of Procrastination'. I haven't met another person who could beat his records of missing in action or postponing appointments. People who have principle always feel shameful for missing an appointment. Personally i tried to fulfill all meetings with my friends and clients, but i would never skip twice not to meet up when promise is made. Missing an appointment is like avoiding to see someone and i feel guilty by doing so. Is always good to meet on all first appointment, when the person you see would definitely feel important. Not this friend of mine. The last three months when i was trying to meet him to collect my rental, it took me twenty times to reach him on phone and yet today i still failed to catch him. Though many appointments were set and confirmed, he had the guts to give excuses to delay and postponed our meeting. He is creative enough to always offer fantastic reasons for not being able to make it. Some of the common reasons are; customers are here, have to send workers, to pick important payments, banker is calling, wife or children are sick, car broke down, need to go outstation and more. The more he delayed and pushed me away, the more i could feel he is belittling me. Thanks God! Patience has saved me to be tolerance with his procrastinating. The next permitted time when i could see him, i might not slap him on his face but i will directly shake his mind until he could be awakened for his wrongful attitude. As King of Procrastination, he would not do well in his business, and neither his family is happy with him either. 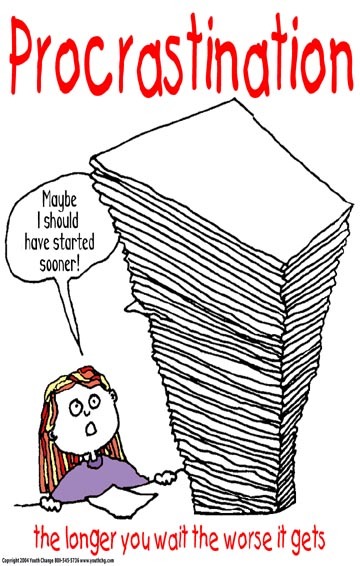 Are you one out there who like to procrastinate? If you are, i suggest you come to see me personally. I have a big rottan for you to solve this sickness. so, i told her... i would write a word and its' meaning each day..
so that our staff could learn more english words (english is not main language in our town)..
and PROCRASTINATION was in my mind! hahaha... this really made my day..
Little darling likes this quotation as well. She makes sure i don't don't need to screw myself, coz i have her. Haha!! What you were saying is The Law of Attraction. The good attracts good eventually. Read my tomorrow title to find out. Happy weekend. Thank you for your compliment to me great friend. Under the rules of ethical writing, attacking a person without his knowledge and without the benefit of hearing his side would constitute a hearsay unless proven otherwise. In this case, andrew is being deprived of his right to explain his side. Thus, a statement of bias is obvious. Nonetheless, we have all the right in what we wnt to say or write but it is unethical if we want to express our ideas at the expense of others.. Thank you for the comment. Everyday is a learning day. I'm too glad to read other thoughts, especially those who have the courage and willing to comment sincerely direct to the writer. I'm sure you are a firm person who has integrity and feeling. I would try my level best to follow your principle and ethic in further writing. For your infor, Andrew isn't the real name of that person. The purpose of sharing this story is for others to learn and avoid their mistakes of life. Thank you once again for reading my blog Ulysses.